Children living in slums are more exposed to hard facts of life. In absence of proper guidance, they can easily fall for any wrong habits. Addiction to smoking and drinking is one of such obvious threats. Children witness the effects of addiction on people’s health, personal, family , and social life. It really depends on the situation how children respond to this. Door Step School runs Community Learning Centers (CLCs) in three slum areas of Pune city. This is an effort to provide learning resources and learning environment to children. Along with helping them in studies, we also try to impart life skills and good habits through various activities at the center. Kumar Nirmaan is one such programme, in which children are encouraged to identify and solve their own problems. 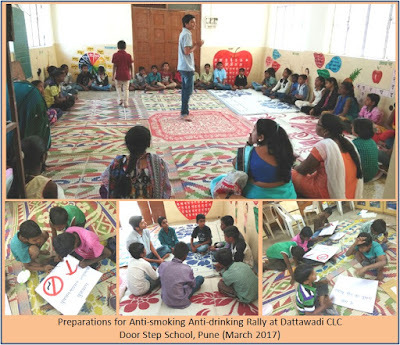 The children from Dattawadi area on Sinhgad Road, Pune recently decided to act upon the noticeable problem of smoking and drinking addiction among the community. 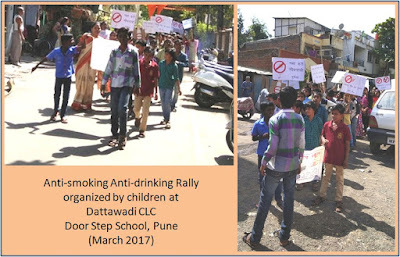 Children came up with the idea of holding an Anti-smoking Anti-drinking Rally in the slum. They discussed this with the CLC teachers and Kumar Nirmaan volunteers. Around 40 children between 10 and 15 years age participated in this activity. They prepared slogans and placards, assigned tasks and responsibilities among themselves, and conducted this rally from Ganesh Mala to Dattawadi center on 18th of March 2017. Volunteers Shailesh and Pranali helped them organize the activity. Children from Dattawadi and Vaiduwadi slums were involved in this. People in the community were curiously watching these children shouting slogans and displaying placards against smoking and drinking habits. We don’t know how many of them would take the children seriously, but we are very sure that the children themselves would be more serious and aware about this issue when they grow up. And that is precisely what we wish to achieve through education - Creating an aware future generation!